The extreme weather patterns observed during El Nino show no sign of abating, with large tidal waves and unusual rainfall continuing to hit Pacific coastal regions. 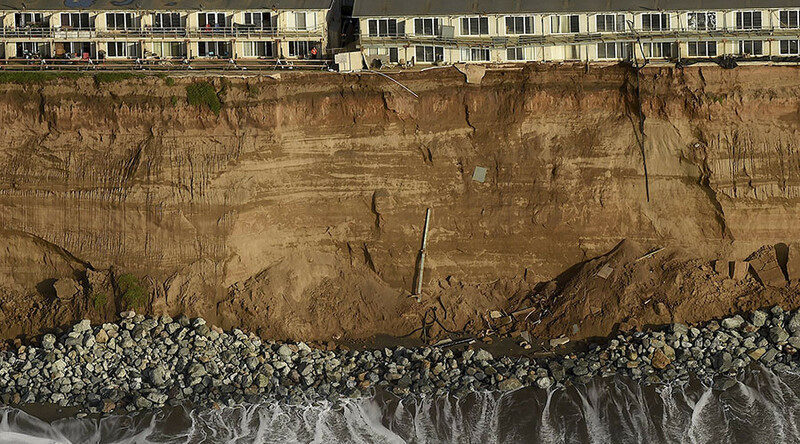 The Californian city of Pacifica has declared a local emergency due to cliff erosion caused by El Nino. Ocean currents are currently battering the city’s shoreline - and putting hundreds of residential properties at risk of collapsing into the sea. Astonishing video captured from a drone reveals the terrifying extent of erosion. The footage shows heaps of soil crumbling from the cliffside, undercutting apartments which hang precariously above on Esplanade and Palmetto Avenue. The owners of the properties have been told their homes are not safe to inhabit. “El Nino is hitting the city’s coastline very hard and creating almost daily reports of impacts to both public and private property,” said Pacifica City Manager Lorie Tinfow. Meanwhile, strange weather conditions have been reported elsewhere in California, from 300 inches of snowfall to parched lakes rising dramatically. A spokesperson for the California Department of Water Resources, which has been managing drought conditions in the western state, told the San Francisco Gate how water levels in Lake Oroville increased by 20ft in less than a week. “We haven’t seen the water level rise like this since we’ve had the drought over the past approximately four years,” he said. Earlier this month, the US Climate Prediction Centre predicted the current strong El Nino - where unusually warm weather brings on powerful storms and floods - to “gradually weaken through 2016”. “Most models indicate that a strong El Nino will weaken with a transition during the late spring or early summer." “The forecasters are in agreement with the model consensus, though the exact timing of the transition is difficult to predict,” an El Nino advisory status reads. NASA analysis of its Jason-2 satellite and research by the National Oceanic and Atmospheric Administration details higher than average sea levels, while last month temperatures in the Pacific equaled 1997 records. The space agency indicate the tropical weather cycle could enter a period of cooling but give no guarantees. But tell that to the inhabitants of the west coast of the United States and South America. Massive tidal waves, some reported to be 16 ft in height, have been seen smashing into the coast of Chile. Footage filmed in the seaside city of Vina del Mar shows an emergency vehicle being swept onto its side by huge breakers coming in from the South Pacific Ocean. As the car flips, passersby can be heard screaming and running for cover. The occupants of the vehicle reportedly escaped uninjured. The tropical thunderstorms come despite suggestions by experts that the meteorological anomaly’s destructive power will lessen in 2016.